How do Superwind’s turbines survive when others cannot? When Martin van Egeren and Klaus Krieger, superwind GmbH´s founders, started out in business, they knew, just a better wind turbine was not the answer. Instead, they set out to design and build a better wind turbine system. 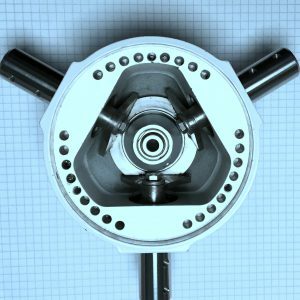 A complete package that would incorporate advances in rotor technology, generator efficiency, charge regulation and a safer way to start and stop the turbine. All make up what we call the Superwind Integrated Concept. The result has been superwind gaining a very high reputation for its innovation across the mechanical, electrical, energy storage, integration and safety disciplines. To best understand some of the finer technology that makes up the Superwind Integrated Concept, we have outlined some of the details below. All these features when combined result in a wind turbine system that survives and operates in some of the world’s most harsh environments, and does so for long periods of time; autonomously. The Superwind, like all wind turbines, uses part of the kinetic energy of the wind and converts it into electricity. The power is approximately proportional to the cube of the wind speed – i.e. doubling the wind speed results in eight times higher power output. Therefore, power from the wind at low wind speeds produces very little energy. However, as the wind speed increases exponentially, high forces suddenly impact the turbine and all of its mechanical components. During high wind events, other conventional small wind turbine technology resulted either in the turbine being stopped by electronical means as soon as it reached its nominal output, going into an even mechanical load increasing “helicopter position” or just into “over-speed” condition, damaging both internal electrical components as well as the blades themselves – Not so with superwind! 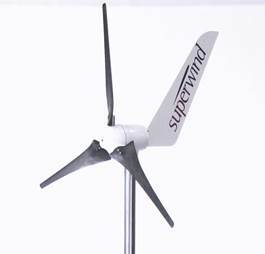 To design the Superwind, special technologies were developed in order to achieve optimum power output for a wide wind speed range, as well as maintain maximum safety in high wind or storm conditions. The following technology has been incorporated into every Superwind to achieve this optimum performance. The rotor blades were developed using advanced computerized calculation and simulation methods. The resulting high tech airfoil then had been wind tunnel tested and was systematically refined and developed for our specially designed rotors – for use in the real world. And here we have to emphasize that the real world with its turbulence, crosswinds etc. widely differs from simple wind tunnel simulations. The result was relatively broad rotor blades combined with a special pitch angle producing a high start-up torque, enabling the rotor to start at only 3.5 m/s wind speed. 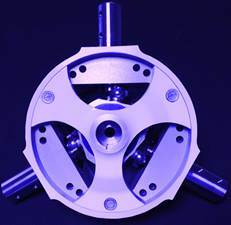 The mechanical controller is fully integrated into the hub and works without expensive electrical or hydraulic components. Instead, the controller is actuated by forces arising at operation of the wind turbine itself. The forces are affected by the geometric and kinematic lay-out of the rotor and controller mechanism. Aerodynamic forces act as a control variable to adjust the rotor blades for power regulation above the nominal wind speed. Centrifugal forces are the second control variable for the rotor blade adjustment. Through the management of both force components, the controller limits the rotor speed automatically (even at extreme wind velocities) and protects the wind turbine from over-speed, even during no-load operation. As a result, the controller limits the mechanical loads at high wind speed, providing smooth operation under all weather conditions. In the SW350, the blade pitch is a function of combination forces on the hub and blade set and the blades adjust in real time to create an operation nearly of noise and free of vibration. In 2016 superwind GmbH took the Autonomous Furling Pitch Blade Mechanism (above) to a new and dynamic dimension. 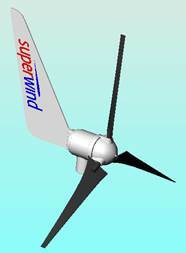 After years of research and design, we created a fully synchronous patent pending rotor blade regulation system that would enable our micro-wind turbines to survive in higher winds and withstand stronger crosswind events than previous technology could accommodate. The STAR Hub™ [Synchronous Technology Autonomous Rotor] enables all the blades to face the same direction during low and moderate winds, but as higher wind conditions become apparent (to even an individual blade) all three blades will instantaneously respond with the same ideal pitch in a nearly instantaneous and completely combined response. This means in areas known for furious wind gusts – or in highly turbulent wind force areas – a superwind turbine featuring STAR Hub technology has the advantage of faster overspeed avoidance and immediate recovery. We regard this a breakthrough technology for the small wind industry! For decades most of the small wind industry had been insisting the wind turbine be turned off when there was “too much wind’ (typically about 12 to 13 m/s). In commercial applications, especially those on high towers or in remote locations, these typical instructions are completely inappropriate. 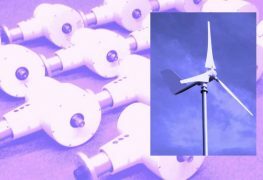 For lack of proper solutions, inexpensive wind turbine manufacturers then began the practice of artificially ‘loading’ their wind turbines to bring them to a stop in high winds. This not only damages the wind turbine components in the long run, but it also wastes precious battery power. As this low cost, low technology fails in the real world; both the turbine, as well as the batteries, suffer. That is a costly price for a cheap fix to stopping a low quality wind turbine in high wind. Superwind’s Integrated Concept’ strategy approach enabled us to not only find a way to keep the turbine loaded whenever there is wind, but by also caring about the way batteries are charged, enabled us to charge all types of commercially available battery types, even Lithium. By designing our turbine with mechanical over-speed controls, we limit how much energy can be sent to the charge regulation system allowing for very accurate and appropriate battery charging to occur no matter how much wind is impacting the mechanical power generation system. More importantly this means the superwind turbine need never be “turned off” once properly installed. The turbine can remain in the ‘run’ condition – always staying connected to the batteries (properly loaded) while continuously under charge regulations management to protect the battery bank from being over charged. Temperature Compensated Charge Control & Diversion Control…. 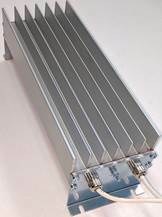 Wind charge controllers are very different from solar charge controllers in that they are designed to electrically maintain the load correlation with the battery bank while simultaneously producing power above the ever changing battery state of charge. This allows the batteries to be properly charged based on ideal temperature compensated charging rates (. The Diversion mode engages when the batteries have reached their maximum charging voltage, and the Superwind Charge Controller’s PWM circuit automatically diverts the wind turbine´s surplus power to the dump resistor block. With this technology, even when batteries are fully charged, the wind turbine continues operating (generating usable power when there is ample wind) providing real time power to other electric consumers (loads) when they come on automatically or are switched on manually. For our commercial customers in extremely cold climates, our diversion system can also provide an additional heat source – allowing the batteries to be either in a state of charge – or potentially ‘warmed’ by the diversion load. Great research, design and product development is meaningless if it cannot translate into a reliable and repeatable finished manufactured good. 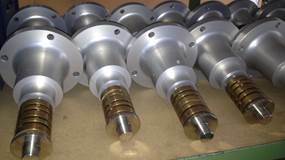 The quality of the components and the quality of the assembly of those components are crucial to the company’s reputation and success. We take this very seriously at Superwind. 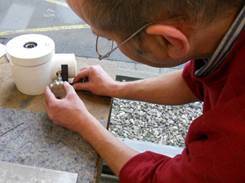 Our quality can be seen in the robust construction of the components we use and our reputation and success can be measured by over a decade of great (well known) repeat customers. During a visit to our factory in Bruhl Germany one of our customers noted “there is hardly any plastic to bee seen!” He was correct. Superwind turbines are made from the highest quality cast (and saltwater resistant) aluminum alloys, highly machined stainless steel and copper components. Plastics are one used in high quality for the rotor blades. Our turbines are built to not only survive – they are built to last. Every Turbine is constructed under a rigorous quality control process and is thoroughly tested before leaving the factory. The serial number on each superwind turbine system allows us not only to identify the turbine as such but also all parts and batches produced by ourselves or by vendors, controller and regulator settings and the persons involved in manufacturing and testing. That serial number is the unit’s ‘Made in Germany’ identity card. The success of superwind has led to the manufacturing of thousands of our high quality turbines and we only allow our own highly qualified, experienced and motivated technicians make and inspect each unit. Our good long term repeat customers appreciate this also!